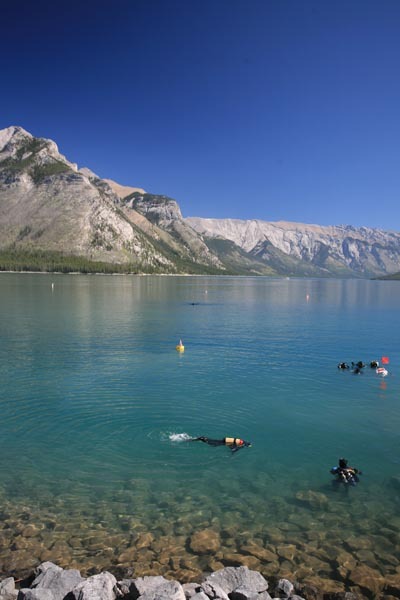 Scuba divers at Lake Minnewanka. Being landlocked, Banff National Park is not renowned for scuba diving. 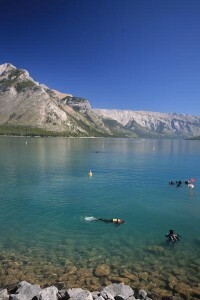 An interesting opportunity for Banff scuba diving—Lake Minnewanka—does exist, however, and it’s surprisingly popular. A rough wagon road was constructed between Banff and the lake, and in 1888, Willoughby Astley and W.H. Disbrowe opened the Beach House, a primitive log hotel on the lake’s southern shore. It offered a dining room, boat rentals, and was a popular base for anglers. Others built cottages along the shore and a community known as Minnewanka Landing slowly evolved. In 1912, the government decided to use Lake Minnewanka as a storage dam for its downstream generating stations. This raised the water level, and as a result, all the buildings were moved to higher ground or demolished. In the early 1920s, a new, larger dam was proposed for a hydroelectric system, but it wasn’t until 1941 that the plan was put into effect. The new dam raised the lake level by 25 metres and doubled the lake’s surface area; the 1912 dam was submerged. Also disappearing underwater was the relocated townsite, comprising four streets, wharves, and a few buildings, and it is this old townsite that attracts coldwater scuba divers through the summer months. For a list of dive shops and sites, contact the Alberta Underwater Council (780/427-9125 or 888/307-8566, www.albertaunderwatercouncil.com).